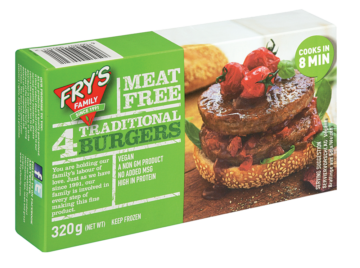 These Traditional Burger patties are chunky and delicious with an authentic flavour, texture and chargrilled pattern. Enjoy these vegan burgers in a bun, with a salad and a side of chips or mix it up with marinades, pineapple rings, cheese slices, mushrooms, onion rings and guacamole. Vegetable protein (16%) (contains Soya · Wheat) · Vegetable oil (Sunflower seed) · Potato starch · Maize Starch · Wheat fibre · Flavourings · Wheat flour (Gluten) · Spices (Contains: Sulphites) · Sea salt · Thickener (Cellulose extract) · Onion · Mustard Powder · Natural Colour (Caramel IV).